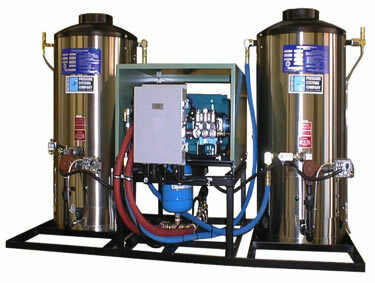 Our natural gas or propane-fired pressure washers are exceptionally well-engineered systems. Designed and manufactured for heavy-duty commercial and industrial washing operations, they will operate for years in the harshest environments. Each machine offers our unique “variable flow” feature, which allows the operator to vary the flow rate and corresponding pressure at the wand when needed—providing flexibility when cleaning various surfaces. 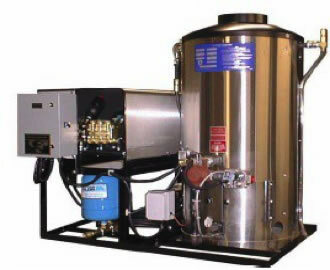 Unlike other gas-fired washers that require maintenance every couple months, our washers are known for their long-lived, low maintenance heating systems and robust construction. Belt-driven with a multi-gun pressure regulating valve and an oil bath plunger pump with thermo-probe protection. 2G40 – Additional G40 heater with extended frame for a total BTUH input of 790,000.